Today, when rival politicians want to settle a deeply divisive issue they take to television cameras or op-ed pages. But there used to be a much quicker way of settling things: Dueling. 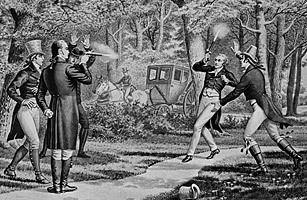 In the most famous duel in American history, after years of personal and bitter squabbling over the role of government, former Treasury Secretary Alexander Hamilton and Vice President Aaron Burr decided to settle their differences with pistols in Weehawken, New Jersey. Think about that for a second  that'd be like a retired Tim Geithner fighting a gun battle with Joe Biden. Anyway, details of what happened aren't clear, but Hamilton was indeed mortally wounded and Burr was charged with murder. He finished out his term as VP, but left Washington in 1805 in disgrace.